Hotel Transylvania (and Hotel Transylvania 2) are favorites in my home. I love Halloween and monsters so I enjoy them as much as the girls. My favorite characters are the Wayne the werewolf and Blobby. 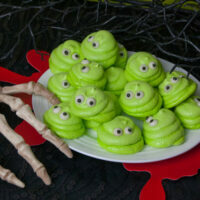 Today I’d like to pay hommage to our little green gelatinous friend with an easy cookie. 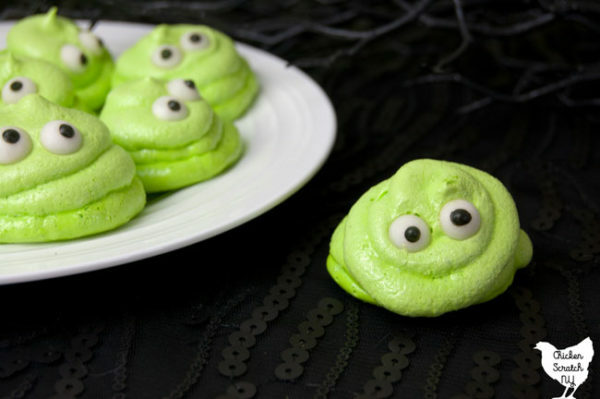 I’m guessing you got here via Pinterest so you’ve probably seem the adorable meringue ghosts? That’s more or less what were going for here with a few changes. I have a recipe up for Chocolate Dipped Orange Vanilla Meringues with a bunch of meringue tips. If you’re new to this venture go check that out! Back to Blobby! The first difference from the ghosts you notice is that beautiful lime green color. I used Wilton Icing Color in Leaf Green and Lemon Yellow. The icing color is a gel consistency and it’s very concentrated. My highly technical method is to pick up a bit on a clean butter knife and wipe it off on the whisk or into the batter. Then I let the mixer do the hard work. Coloring meringue is tricky all on it’s own. The color lightens up as you whip the air into it. I like to add the color when I’m about 1/2 way through adding the sugar. That gives you a good idea of what the final color is going to be and you’ll still have some time to add more coloring without worrying about over mixing the meringue. As long as your meringue is still glossy you’re good. The next thing I switched up was the flavor. To me, Blobby looks like lemon-lime jello. Maybe he’s the love child of BOB from Monsters vs Aliens and that jello with the pineapple chunks from the party? 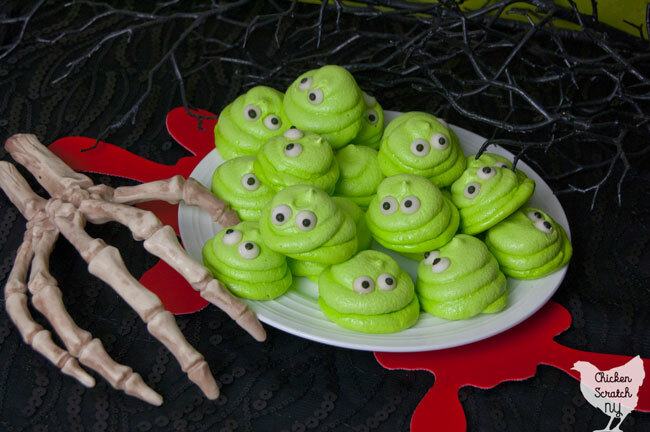 Moving away from children’s movies conspiracy theories… I used lemon extract to flavor the meringue. You can also go with almond, vanilla, orange, etc. 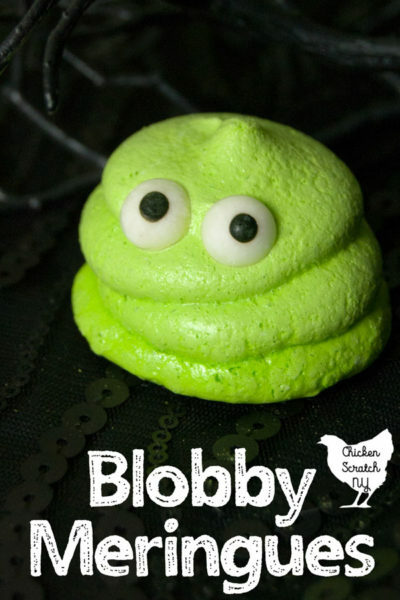 The easiest way to get the Blobby body shape is with a piping bag. Meringue is very sticky, use the biggest bag you have so you don’t have to refill it three times. I had to refill my bag three times, it makes such a mess! If you’re looking to cut corners you can skip the piping tip and just snip the tip off the bag. You can even use a zip lock bag in a pinch but you won’t get the perfectly rounded shapes I have here. 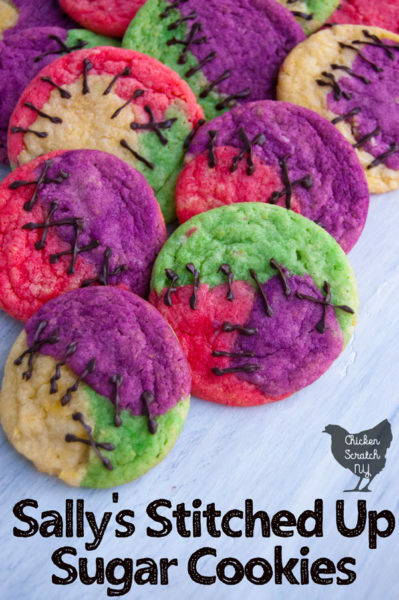 The beauty of these cookies is they need to be a little bit sloppy, they’re still cute even if they’re a little awkward. 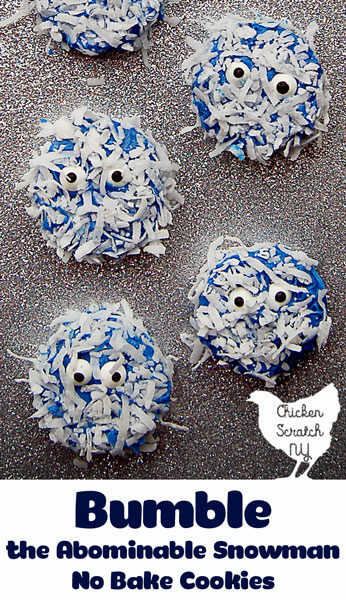 If you’ve ever been intimidated by a piping bag this is a great recipe to practice on. After your meringue is transferred to the piping bag and your cookie sheet is lined with parchment paper it’s go time. Start in the center and make about 3 swirls of meringue moving up and in with each row. I found it easier to make a row of cookies and then add the eyes before moving on to the next row. I’m pretty clumsy and I had enough trouble adding the eyes without trying to move around the other cookies. The meringue is sticky remember? If you’re in the groove you can do all the piping at once and go back to add the eyes. Full disclosure, I didn’t have enough eyes for all my meringues. I was using up the left overs from my Bumble No Bake Cookies. The small eyes come 100 in a pack and this batch makes ~40 cookies depending on the size so if you’re starting with a new pack you should be covered. This batch of meringue cookies almost did me on over one little environmental problem. I’ve never lost a batch of meringues, I make them every year for Christmas & they’re a staple on my Christmas cookie trays. I made these before bed and after I turned off the oven I went to sleep. The next morning I woke up and eagerly checked on my cute little cookies. They were sticky. Luckily I haven’t lost my touch but it turns out the meringues were not match for the August humidity. A few more minutes in a 200 degree oven and they were nice and crispy again. Moral of that story, if you have sticky meringues toss them back in the oven. Don’t forget to PIN this to your Dessert board! Bake for 1.5 hours or until cookies are hardened. Turn off the oven and allow the cookies to cool inside for another 1.5 hours.